Asia and the Pacific region has one of the highest exposures of any region in the world to natural hazards. Weather-related risks, particularly hurricanes, flooding and drought, are a frequent occurrence and affect crop yields, livelihoods and assets, and the personal safety of vulnerable groups across the region. The frequency with which these disasters occur often taxes the ability of such groups to rebound quickly, increasing their risk of hunger and malnutrition. Low-cost agricultural insurance schemes are increasingly viewed as mechanisms for providing social protection to the increasing numbers of people affected by such risks and in helping to lessen the impacts they suffer owing to such shocks. 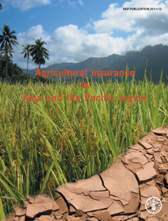 This publication is based largely on the outcome of a study commissioned by FAO to provide a comprehensive up-to-date review and assessment of different models of agricultural insurance provision in Asia and the Pacific region, together with guidelines and recommendations for policy-makers seeking to introduce agricultural insurance programmes. The information is presented in a comprehensive but easy-to-read format that allows direct comparisons to be made between countries. The document also provides valuable insights into the sustainable implementation of insurance programmes in the region.